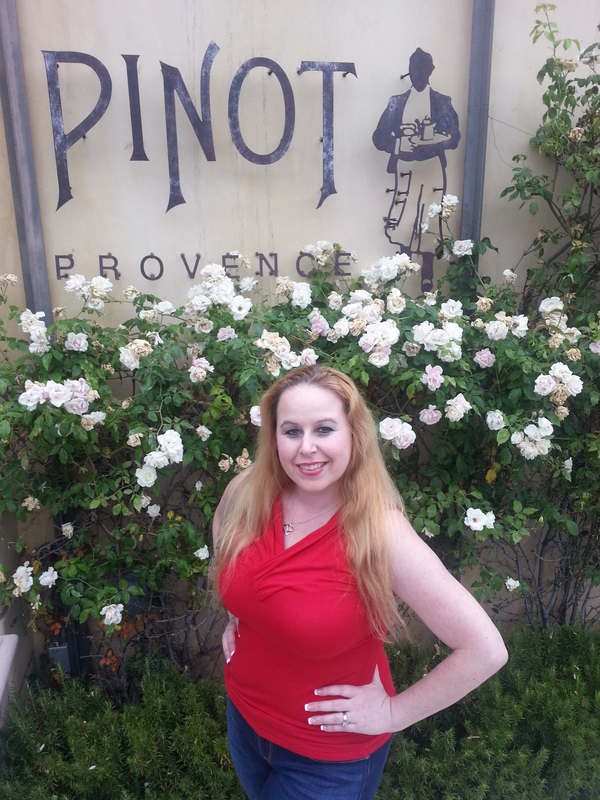 I was very excited to be invited to attend the special French wine pairing meal at Pinot Provence this past Wednesday, July 10! In honor of Tour De France, the restaurant put together a variety of special dishes with specified glasses of wine to accent the flavors of France. This special wine pairing dinner will also be taking place this upcoming Wednesday, July 17, so make sure to book your reservation quick as I am sure they will fill up! 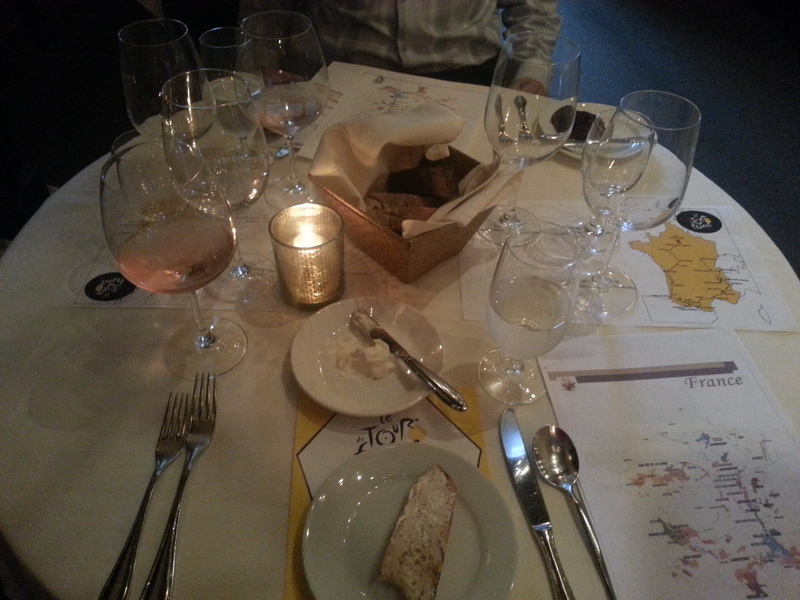 Upon being seated in our quaint & comfy room full of beautiful French décor, the table was nicely set up for wine pairings with a special map of the wine regions. There were 4 different glasses to encompass each serving of wine that matched the different varietals in order to allow them to breathe properly and have the utmost flavor and aroma. 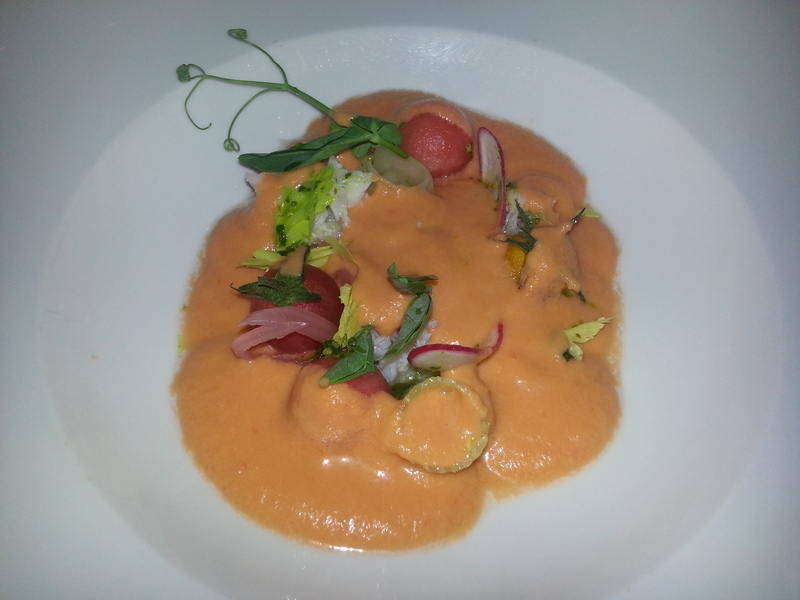 For the first course, Executive Chef, Alfonso Ramirez (recently nominated as one of the top chefs for the Riviera Magazine) brought to our table a fine porcelain dish with gorgeous vegetables, Dungeness crab, heirloom tomatoes, and basil pistou. Upon setting the bowl down, he delicately poured the tomato gazpacho to gently cover the crabs and vegetables. 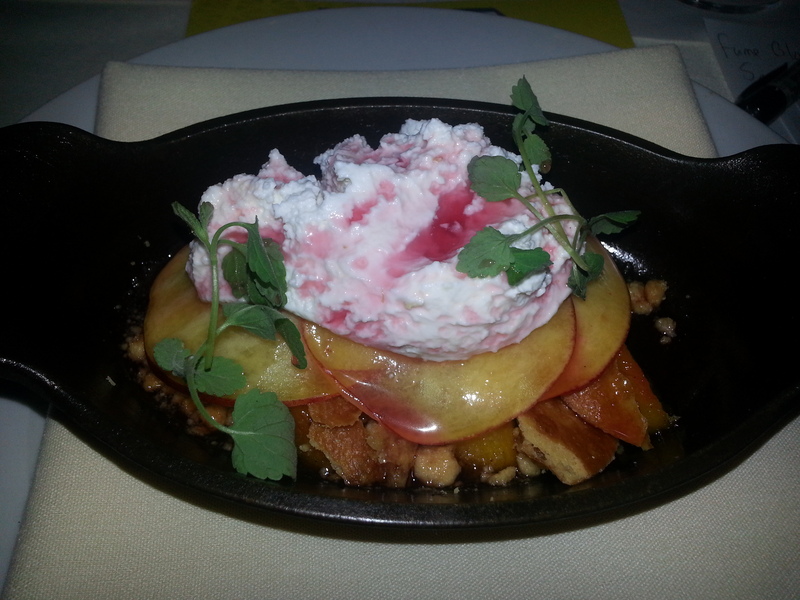 This was served with a fresh & crisp glass of Rose from France called Chateau de St. Martin Rose 2012. For those of you that know me, I am not usually a Rose person, but this one was pretty amazing and with the cold gazpacho, these literally were a slice of heaven paired together. aged in stainless steel. 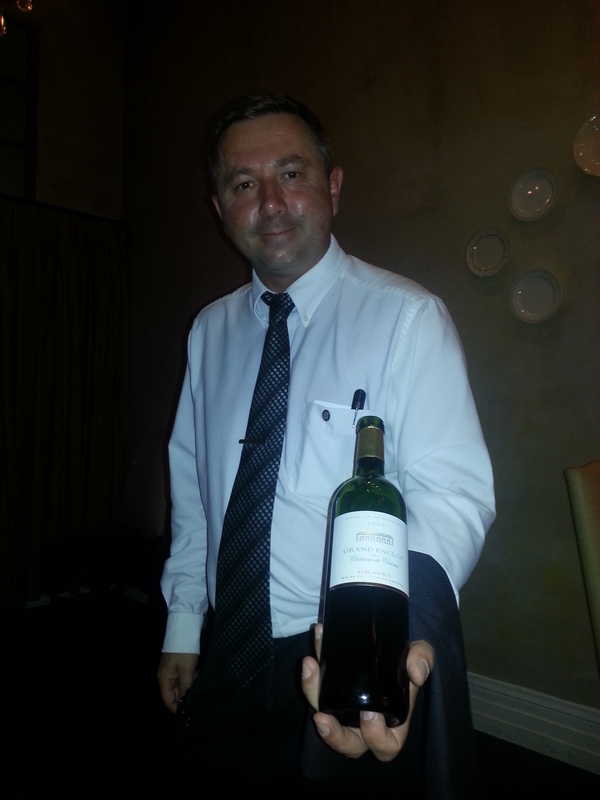 The flavors of this wine were pretty amazing and our Sommelier; Francois (loved him!!! 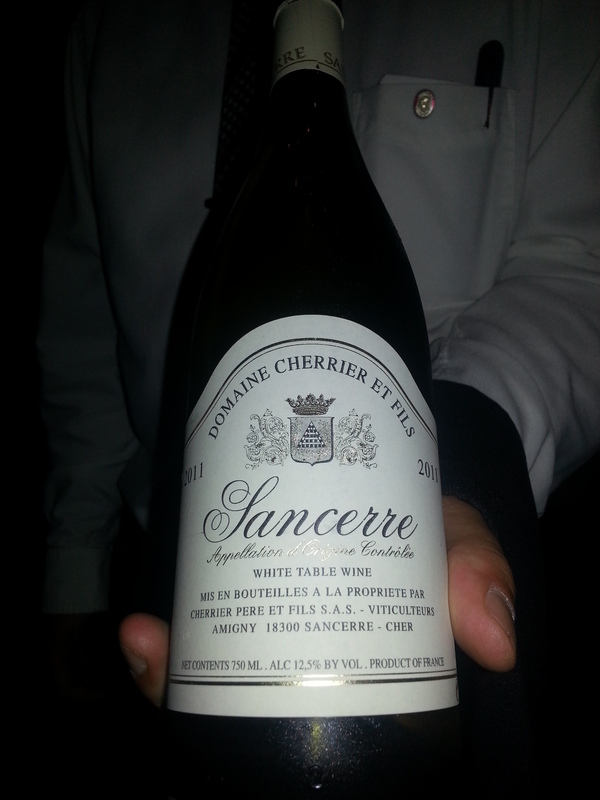 )shared with us that the soil where the grapes are grown for this wine in Sancerre is made from clay & limestone and is rich in flint and is a 100% Sauvignon Blanc. Another interesting factor he shared with me that I did not know before was that Fume Blanc is the same as Sauvignon Blanc, but it is aged in Oak. 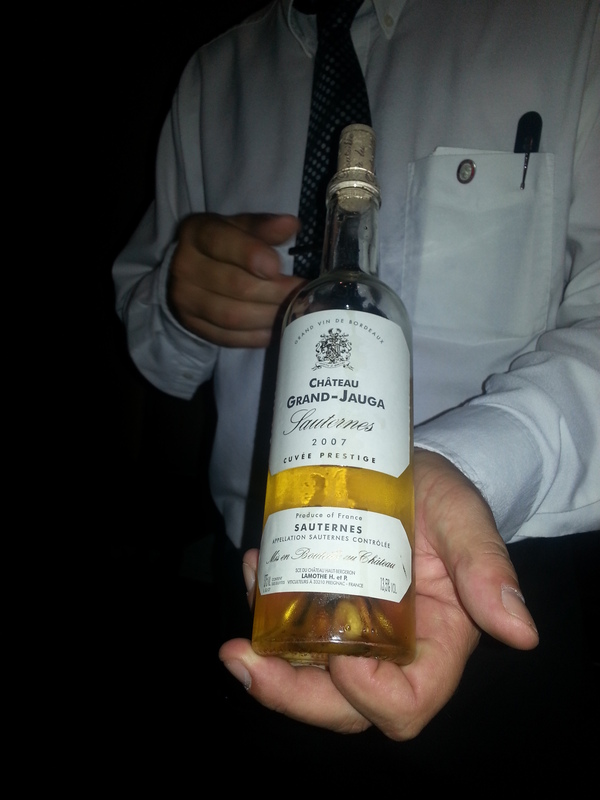 Trust me…when you attend this wine pairing dinner or come to this restaurant, you will also learn a great deal about wines from this fabulous Sommelier! 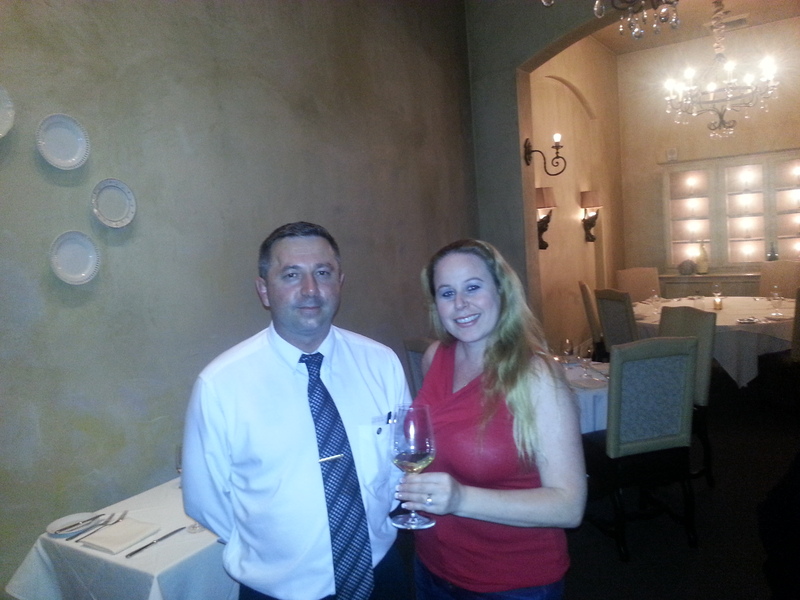 He was literally the friendliest most informative sommelier I ever met in any restaurant! For the third course we were served a roasted duck breast, celery root puree, summer squash, and duck liver jus with a glass of Grand Enclos du Chateau de Cerons 2005 which was a red French Bordeaux. The duck was succulent in flavor as the tender piece of meat melted in my mouth. The combination of items used by Chef Ramirez caused a joyous pleasure in my mouth that instantly elated happy thoughts and memories of sitting in a café in Paris, France! This dish was done phenomenally well and paired perfectly with the red wine. 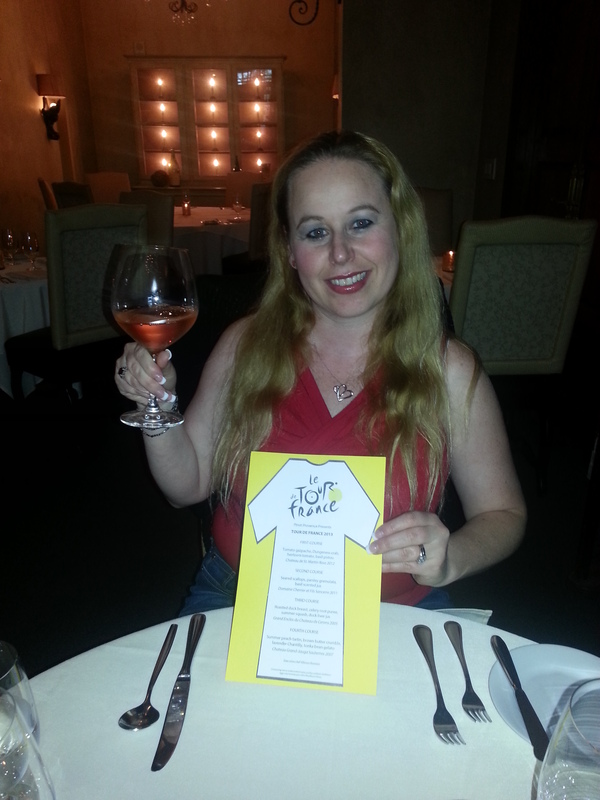 I recommend making a trip to this restaurant, Pinot Provence for the last night of the Tour De France Menu that will be held this upcoming Wednesday, July 17. The four-course meal is $70 a person, $100 with wine pairing (believe me…wine pairing is a must) 🙂 Reservation time slots are available between the hours of 5:00pm & 9:00 pm. If you thoroughly enjoy good food and wine, this is one event you do not want to miss. Even if you cannot make it this upcoming Wednesday, check out Pinot Provence soon! It is conveniently located across the street from South Coast Plaza and is attached to the Westin hotel down the street from a variety of theaters, including Segerstrom Center for the Arts and the South Coast Reperatory. Enjoy! See another wine pairing dinner called Sommelier Fireside Dinners happening October & November 2013 here —> SOMMELIER FIRESIDE DINNERS. The Patina group restaurant, Leatherby’s Café Rouge also regularly caters to feed our students from the Alternative High School program in which I work at a performance of theater and arts called, “Summer at the Center” that takes place every year at the Segerstrom Center of the Arts in Costa Mesa, California. 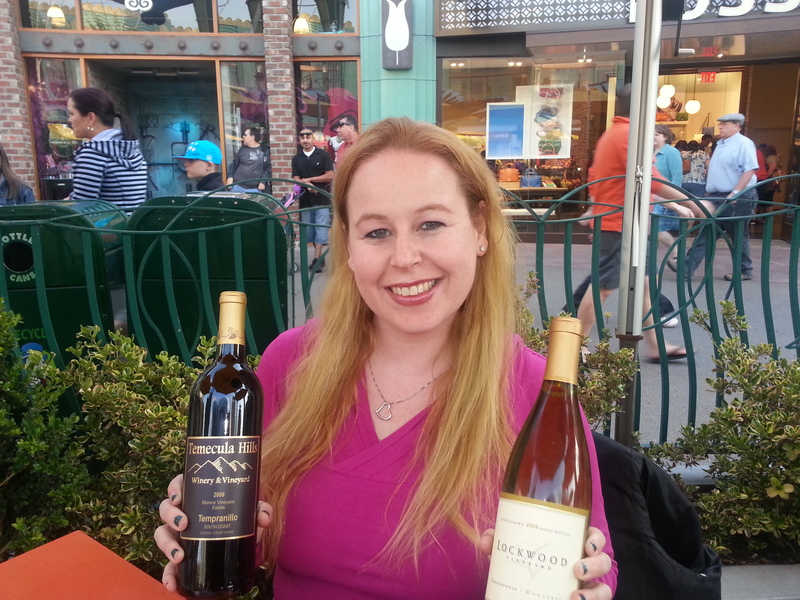 I have dined at the Uva Bar, Catal, & Naples Restaurant in Downtown Disney. I have also dined at the Leatherby’s Café Rouge and on our school field trip to the Los Angeles County Museum of Art, Patina Group provided catering. Patina Restaurant Group , has a large number of restaurants throughout the United States and an awesome fact I love about them is that several of their restaurants have no corkage fees when you bring in your own wine! I have written about this in the past, see my article here for details about it: No Corkage Fees. Food and wine are my top faves in life.great shots! Me too!! We are the same;) Thanks! Have a great night!! 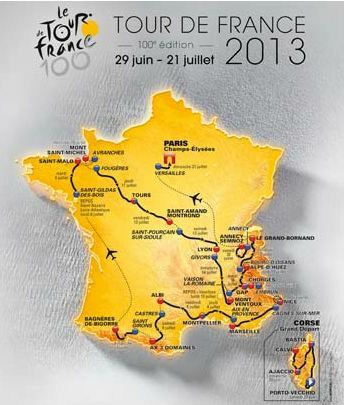 I had the privledge of being at The Tour de France about four years ago as they were finishing thier laps in Paris around the Champs d’lysee. It was an amazing experience that I won’t forget. That is awesome Karen! I would love to do that one day:) Thanks for sharing!! Been fun and interesting reading your explorations! Thanks Brad:) Glad you enjoy! Your life sounds like one amazing adventure! WOW…that all looks delish, and the portions are so BIG! You get to have so much fun! seared scallops! one of my favorite dishes! i was drinking sangria with the scallops this weekend! There is nothing like fine dining and good food! Yum! 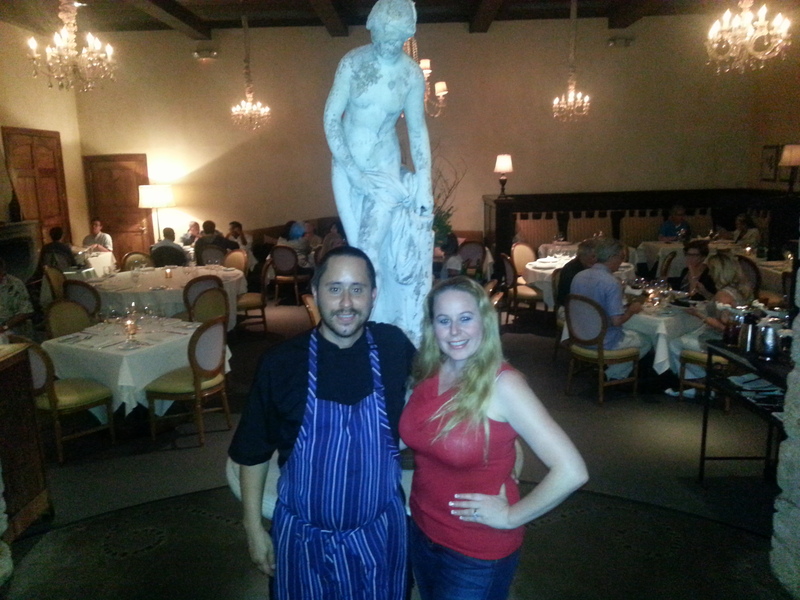 This was a great wine pairing dinner, made by one of the more respected Chefs in Orange County. 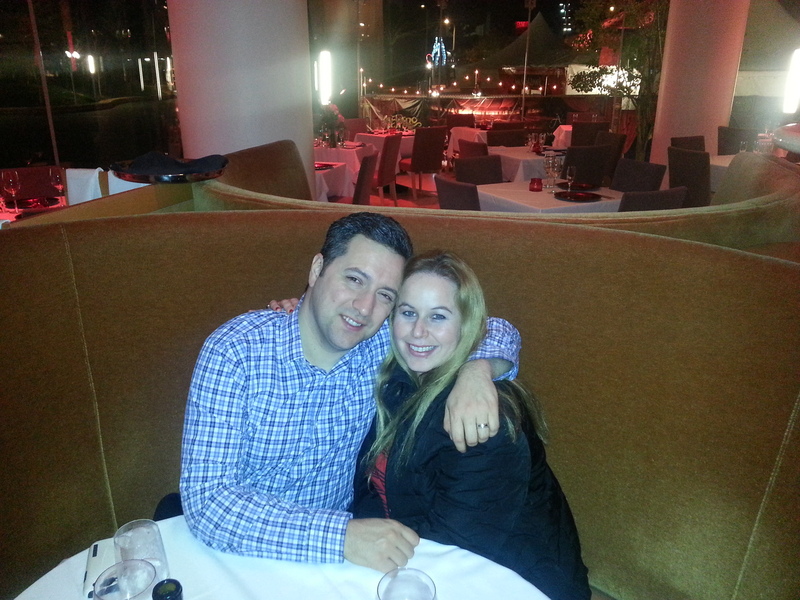 I loved the food and impeccable service by Francois. Keep up the great work guys. Thanks for the comment Tom:) I could not agree more! 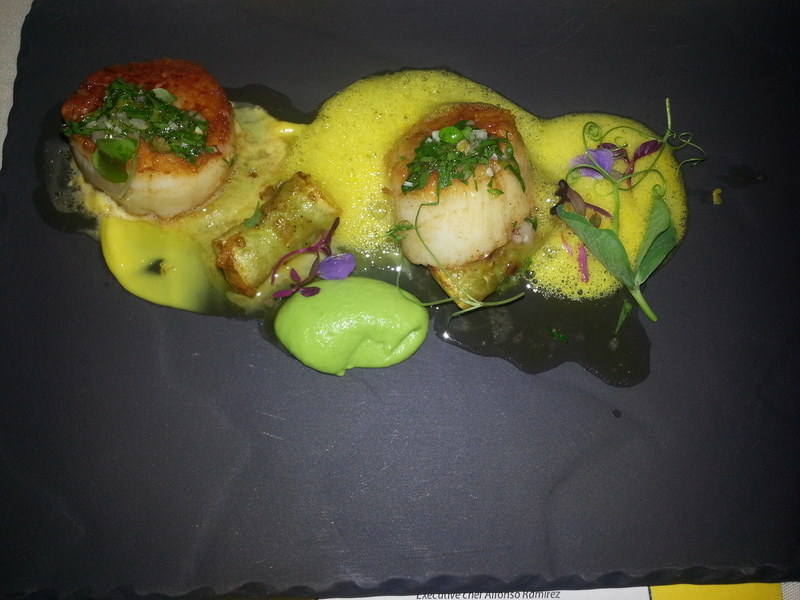 I feel like I experienced the wine pairing dinner with you–love all of the photos! MMMM those dishes always look so yummy and make me just want to go to a restaurant and be lazy and let someone else cook. Looks like you had fun, thank you for sharing and I will pass this along. Sounds like the next best thing to actually having dinner in France. I love it:) Thanks for the comment! How wonderful for you Daniele! It sounds exciting. I wish I lived closer. Looks like a great event. Now I’m jealous! LOL… Great post and it the wine I’m sure was spectacular!!! Yes! 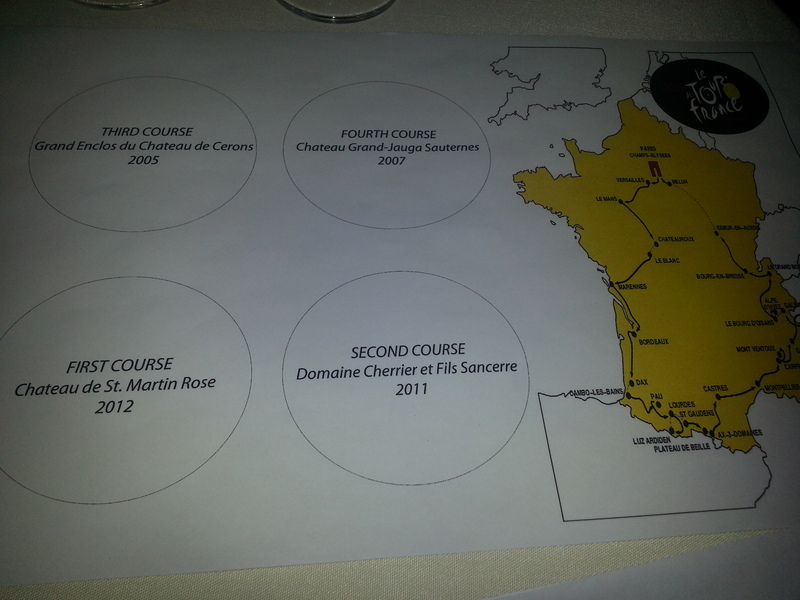 The wines from France paired perfectly with each individual dish for sure! I should stop reading your great blogs before dinner. Sounds like a fun time…Wish I could go too! That’s some fancy looking food… I bet it tastes as fabulous as it looks! Great photos and great article! 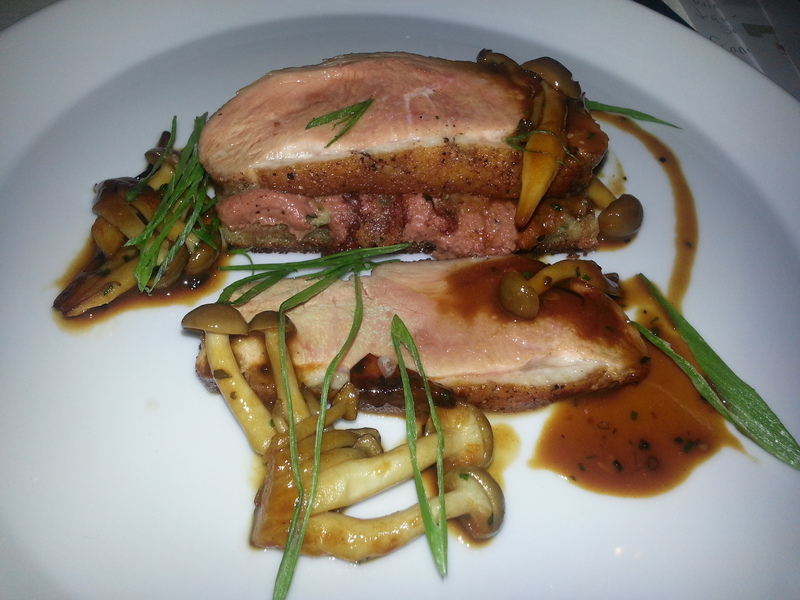 I have never tried duck but it looks delish! Really?? Oh you must try duck!! It is so tender and amazing!! Excellent pictures and article! Thanks for sharing. I particularly liked the look of that Gazpacho – I’ve never seen one of that consistency. Thanks for the comment Moira! That gazpacho was definitely pretty amazing!! Yes!!! Thank you:) ❤ That soup was definitely amazing! Wow, what a great time it looks like you had there! I bet it was all so yummy! Thanks for sharing!